Bestselling author Marcus Chown explores some of the most profound and important science about us, our world, and beyond by examining some astonishing facts that reveal the vast complexities of the universe. 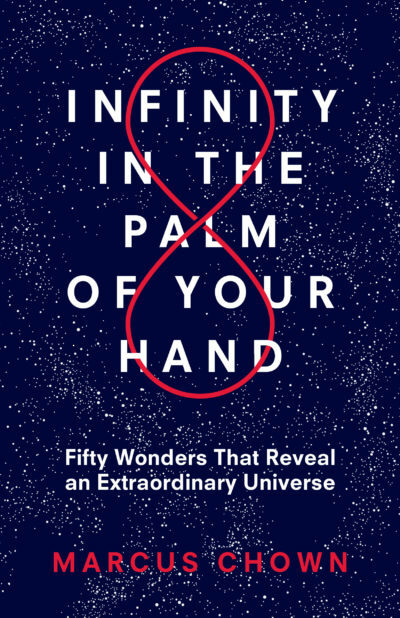 Perfect for fans of Astrophysics for People in a Hurry and A Brief History of Time. My dad got me out of bed to see the first moon landing. I still can’t believe I was lucky enough to be a kid when the first human stood on another world, surely as significant an event in the history of life as the moment the first fish crawled out of the sea onto the land 380 million years ago. It was so exciting. Even writing this about it sends a shiver down my spine. What’s cooler—earth science or space science? I am biased and would say space science. It’s hard to top a laboratory that’s the size of the universe! Okay, I’ll bite. What’s the Grandmother Advantage? One of the big mysteries in human biology is why women have a menopause. Only a handful of species, including humans and killer whales, shut down their reproductive potential early. Females of every other species keep reproducing until they die because that is the best way to produce the most offspring and ensure their genes survive into the next generation. One explanation of why humans do not do this is that a woman, by losing the ability to reproduce early, makes herself available to help her daughter raise children. Because her grandchildren share her genes, she is helping promote her own genes. Can you explain the significance of your book’s title? Of all the scientific breakthroughs and discoveries you reference in your book, which do you think was the most important? I think the recent discovery of gravitational waves—ripples in the fabric of space-time predicted by Einstein a century ago—is pretty important. We’ve always been able to “see” the universe. Now, at last, we can “hear” it. Gravitational waves are the “voice of space.” Things can get over-hyped in the media, but there is a good case to be made that the discovery of gravitational waves in 2015 was the most important development in astronomy since Galileo turned his telescope on the heavens in 1609. Incidentally, the source of the first gravitational waves—two merging black holes—pumped out 50 times more power than all the stars in the universe combined. Or, to put it another way, had it given out light rather than gravitational waves, it would have shone 50 times brighter than the entire universe. The single most powerful event ever witnessed by human beings! In your book, you say science writers have a lot in common with comedians. How so? That was a bit tongue-in-cheek! I was thinking that, just as comedians at parties might be expected to come out with a joke, science writers might be expected to come out with an earth-shattering scientific fact. Is it true you’re one-third mushroom? Well, you and I and everyone shares one-third of our DNA with mushrooms. It’s an indication that we’ve evolved by a process of natural selection from a common ancestor. Actually, the ultimate proof of this is that there is a particular sequence of DNA in every one of the 100 million cells in your body—in fact, in every cell of every creature on Earth. We truly are all brothers and sisters. How old is today’s sunlight—and how do we know? Today’s sunlight is about 30,000 years old—it was made at the height of the last ice age. We know this because “photons” of light have extreme difficulty getting from the core of the Sun, where they are created by nuclear reactions, to the surface, where they can fly off into space to the Earth. It’s a bit like you trying to fight your way down a crowded shopping street at Christmas. You have no choice but to zig-zag to avoid people. Similarly, photons in the sun are forced to take an incredibly tortuous zig-path to escape the Sun. Since we know how much stuff is in their way—specifically, the “density” of the Sun—we can calculate that they take about 30,000 years to get out. What did you mean when you said that sunlight is just a byproduct? And aren’t you worried that people in California and Florida who depend on tourism dollars will hate you? In one of your chapters you say “Every breath you take contains atoms breathed out by Marilyn Monroe. Or Julius Caesar. Or the last Tyrannosaurus Rex ever to have stalked the earth.” How can that be? Basically, atoms are very small: 10 million would span the full stop at the end of this sentence. That means there are an awful lot in every mouthful you breathe out. Think of how many “mouthfulls” of air it would take to fill the Earth’s atmosphere. It turns out that it’s fewer than the number of atoms in a single mouthful. Therefore, if the atoms in a mouthful of air breathed out by, say, Marilyn Monroe, spread out evenly around the world, every breath you take in will contain not one but several of those atoms. Don’t worry if that’s making your brain hurt. It’s making my brain hurt, too! Your book hits stores one day after Earth Day. What do you say to people who don’t believe in global warming? The earth is demonstrably getting hotter and we have ruled out the Sun being responsible. Carbon dioxide traps heat in the Earth’s atmosphere, and the rise in temperature over the past century perfectly tracks the rise in carbon dioxide from the burning of fossil fuels. Given that global warming is potentially catastrophic, even if you were highly skeptical of this, it would make sense to reduce the burning of fossil fuels in case you were wrong. Fifty percent of the cells in your body do not belong to you. They belong to microorganisms hitching a ride. For instance, there are about 30 million bacteria on every square inch of your skin, and you would be unable to even digest your food if it were not for bacteria in your stomach. But here’s the point: You acquire the foreign microorganisms only from your mother’s milk and from the environment. So, you are born 100 percent human but die 50 percent alien.